Gragnano is a small town South of Naples that is said to be the birthplace of dried pasta. A form of short-cut past in the shape of a large grain of rice. Ideal in a casserole or pasta dish. 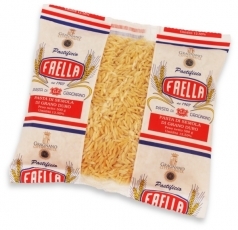 Pastificio Faella is one of those unique family businesses that remain unaffected by time and are faithful to the original product.